A microchip cat flap will fit in the same space as a regular cat flap but give you so much more security and peace of mind. What Is The Best Microchip Catflap ? These are our choices, which we have listed in a rough order of how much we like them, with a short description why. Click or hover on the yellow box to find out the current price, and if you want to find out more, click the “read more” to take you to the review. what is a microchip cat flap ? If you’ve got a standard cat door you could be feeding the local, feral Tom every single day and causing your cat unnecessary stress. Or perhaps you want to keep tabs on your moggy – when they come and go and even stop them going out late at night or if they are on medication or recuperating? A normal catflap is great for letting your cat in and out as they please. However, this also means other local cats and animals can do the same. How Do Microchip Cat Flaps Work ? 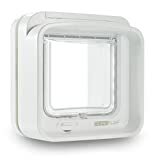 A microchip or electronic cat flap has a latch that is usually locked. However, when it detects a microchip nearby it reads it and, if it matches one on its list of approved cats, releases the catch for a few seconds to let your cat in. This microchip technology is also used for things like cat feeders. The time that the latch remains open can be set on most of these pet doors. The basic ones just do this but others offer the ability to set it to lock your cats in at set times or selectively stop certain cats leaving (if they are on medication for example) and some will even let you control them via a phone app from pretty much anywhere! The microchip codes are anything up to 15 digits long but do not worry, you will not need to type them in. What you do is to set your flap up and put it in program mode. You then simply encourage your cat to put their head in the flap with a treat or, simply pointing at it for more inquisitive cats. The flap with then recognise it and log it. The other advantage of this approach over manually typing it in is that it ensures the catflap works with your cat’s microchip. There is a wide selection from the most basic, that simply read your cats chip and let them in, to those with mobile phone apps to control them that will let you know whenever your cat comes or goes. But which one is the best for you? The good news is that I have not found any of the models from the main manufacturers to be poor. So don’t feel tied to our selections if you find a great deal or just prefer how one works. In this section we give an overview of the pros and cons of a selection of our favourites, however, they may not be yours! Sureflap make a range of catflaps, both microchip, and standard, so why have we picked this one as our overall winner? The weakness of the original flap was that, while intruders could not push their way through, smart animals like squirrels or raccoons could their claws behind the panel, and pull it towards them and get in! So, they added a second scanner and lock, which meant that whether it was pushed or pulled, it was not going anywhere! The problem is that at some point you will need to restrict one of your cats from going outside if they are recuperating or on certain medications. 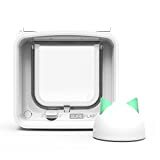 The only solution used to be to stop any of your cats from venturing outside, however, this catflap lets you not only program which cats can get in, but which can get out too. This is what the dualscan part of the name means. It can do this for up to 32 cats…which should be enough for most homes!! Naturally if your cat manages to escape, they can still get back in, but if you tell this catflap not to let them out, it will simply not open. Since this additional functionality is is only a few pounds more expensive than the standard Sureflap catflap, we think it is the best balance of performance and price. SureFlap are also one of the leading manufacturers and offer a 3-year guarantee with some great customer service in our experience. Like all of the SureFlap range it will work with 9, 10 & 15 digit microchips as well as RFID collars if your cat is not microchipped. It runs on 4 x AA batteries, which will last about a year for two cats that use the flap moderately, although I tend to change mine more frequently to be safe…you really don’t want to shut your cat out on a cold winter’s night because the batteries died! The DualScan fits in the same size hole as the others in the range, so it can be fitted easily if you previously had a SureFlap. If not, the fitting one in a standard door is pretty straightforward for anyone with basic DIY skills and tools. To fit it in a glass door will generally require the services of a glazier or a builder to install one in an external wall. If you have a wooden door and do not want your cat flap to stand out too much, it is also available in brown. 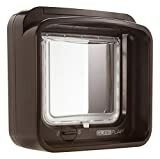 OK, this Sureflap Connect pet door quite a pricey catflap, so what makes it worth the extra? Essentially this gives you total control of your catflap from your phone! Once set up, you program in your cats (up to 32 of them!) and you can then configure it – don’t want you pets going out at night, or want to restrict one of them, a few clicks and swipes on your phone and it is done…from anywhere! You also get a full report of which cats are in and which are out, when they were out…basically whatever you want from a catflap, this one will do it or none will! It is just as easy to install and set-up as any other electronic catflap and it is powered by 4 x AA batteries, which will last about a year for two average cats. The hub itself is very easy to set up and connect to your home’s wifi. You then download the app from the appropriate App Store (Android or iPhone), connect them and set up your cat’s profiles. You can then get alerts whenever your cats come or go. The downside of this is that it is also deeper than other flaps, which, with the “click” when the latch disengages, can put more timid cats off using it. Usually, they get the hang of it within a week if you entice them with treats, but some cats can take longer. The other downside is the styling, which I find very dated compared to the cleaner lines of competitors like SureFire, but this is very much just a matter of taste. Like most of the others it runs on 4 x AA batteries which will last for about a year with 2 cats using it moderately. It is solidly made and if you are not interested in timers, restricted exit or phone apps for your catflap, it is very good value for money indeed. It also boasts a timer, so you can stop your moggies getting out at night or during the rush hour. It should be noted that without the timer the door can always be opened from the inside, in case a foreign animal gets in. It is also available in both white and brown, so it will not show up too much even if it is larger than the average. Other than that it features all the usual things you would expect – it can read 9, 10 & 15 digit microchips for up to 9 cats and takes 4 x AA batteries. The build quality is good and the catch is not too loud, so should not upset your cats too much when they are learning to use it. Most other cat flaps are battery powered so the battery could run out. The Petporte come with the option of a mains power supply, with the added backup of battery power in case there is a power cut. This option is best used when the flap is mounted in the wall as a door or window with a cable are probably not going to work too well! The PetPorte catflap itself is well made and comes with a timer and a “dusk mode” which detects when it is getting dark and then stops cats from getting out, so it is well equipped. There are a few quirks though. Firstly, it uses a 9V battery rather than the usual 4 x AA, which are harder to find. However, the bigger potential issue is that it only recognises the 15 digit microchip IDs so make sure you know which type your cat is fitted with. Other than that, it is a very well specified catflap that makes a really good option for wall mounting. If your cat has an incompatible, older style microchip or you simply do not want to have your cat chipped, the PetSafe maybe the solution. This PetSafe will work with an RFID tag that you can buy and attach to your pet’s collar. With this in place it acts in exactly the same way as a microchip, so you can program it to only let your cats in. Other than this feature it offers all the usual features you would expect, including recognising all the main types of microchips and capable of storing the information of up to 40 cats. So if you cannot find a way to get this one to work, you probably will not find any! Powered by 4 x AA batteries, which should be good for about a year in typical use, and has extenders available to allow it to be wall mounted, it is a very good option. The Dualscan is our overall winner, so it will come as no surprise that, since it is available in brown, it also wins our pick for those of you with wooden doors! As mentioned elsewhere, it works with 9, 10 & 15 digit microchips and does everything you could want of a microchip catflap, including setting it up with different permissions for different cats. 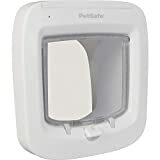 We also like this catflap as the catch is quieter than most, which makes it much less alarming for cats and hence, they get used to using it faster too. So there you go, if you want a brown catflap, then why not just get out top pick! My name is James Winsoar and I took early retirement from a job in the City as an IT manager a few years ago. I now fill my time as a handyman and seem to spend a lot of my time installing these after installing one of the early catflaps for our cats! I have installed them in glass, wooden and metal doors as well as the occasional wall. So I have also come across pretty much every one of these electronic catflaps on the market. And of course, if you need a catflap installed in the Kent or Sout-East London area, do get in touch! 1 What Is The Best Microchip Catflap ? 2 what is a microchip cat flap ? 3 How Do Microchip Cat Flaps Work ?